Two decades before the Ellen MacArthur Foundation established its mission to accelerate the transition to a circular economy, Tim Jackson began working for the Stockholm Environment Institute on a plan to develop what was called at the time preventive environmental management. It’s core idea was simple: prevention is better than cure. Preventing environmental damage at the outset is better than cleaning up after the fact. Drawing inspiration and advice from key figures in pollution prevention, waste minimisation, energy efficiency and clean technology, Tim began to pull together the scientific basis for a very different kind of approach to industrial production. Clean Production Strategies, published in 1993, collected the elements of this approach together and included chapters from pre-eminent writers in the field, including Walter Stahel, Bill Rees, Bob Costanza. 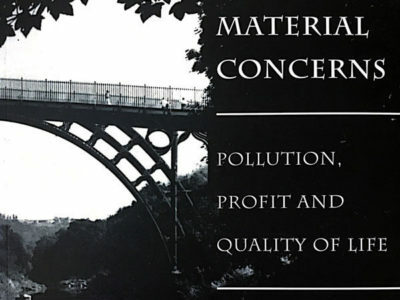 Material Concerns, first published in 1996, synthesised the findings into a manifesto for change. Rooted in the laws of thermodynamics and informed by a clear understanding of ecological limits, the core idea in preventive environmental management was to move industrial production away from an extractive linear system towards a more circular economy. ‘In ten years time,’ wrote an advisor to the former British Prime Minister Gordon Brown, ‘all managers will be thinking in this way.’ The prediction didn’t quite come true, but it did prefigure a mounting interest in the circular economy. The final chapter of the book also provides a fascinating insight into Tim’s early views on the relationship between human wellbeing and economic growth. The title for the book was ‘borrowed’ from the title of Tim’s second play for Radio 4. Video: Tim Jackson discussing ‘Material Concerns’ with Ellen MacArthur Foundation’s Joss Blériot and Ken Webster. 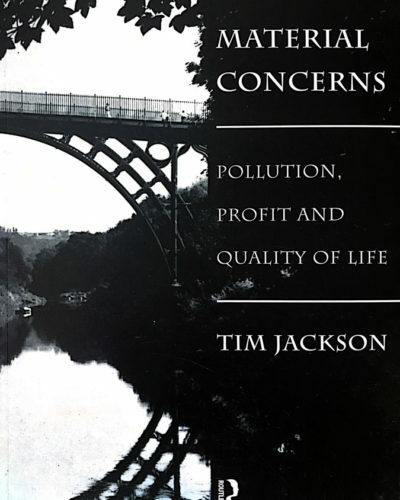 “Clear and compelling…Jackson provides both the conceptual framework and convincing illustration of the new environmental paradigm of industrial production. In ten years’ time all managers will be thinking this way.” — Michael Jacobs, former advisor to UK Treasury and No 10. “Jackson has filled a near-unique niche in clean production publications with a text that combines great explicatory power with a driving visionary message.” — Andrew Tickle, Birbeck College London. The full review is available on the Wiley Online Library website.